In September 2013 this column spotlighted the North Tracy Historic District. The article noted the brick residence at 322 North Tracy Avenue, which is attributed to a black builder named George Harrison. As February is Black History Month, this column tells Harrison’s story. George Harrison arrived in Bozeman 1876. The precise year of his birth is difficult to ascertain. The 1880 census of Montana Territory indicated 1857, but official documents, including voter registration records and marriage licenses, state a year of birth as late as 1868. All of these documents identify Harrison as a black man born in Utica, New York. Suffice to say, Harrison was one of thousands of Americans who sought opportunity in the West after the Civil War. The 1880 census recorded Harrison as an unmarried black man living in Bozeman who worked as a day laborer. As one of the 346 black persons in Montana Territory, Harrison’s racial demographic comprised less than one percent of the state’s total population of 39,159. Harrison was part of the small black community in Bozeman during the last third of the 19th century. His contemporaries included Samuel Lewis, who was born in Haiti and brought to Utica, New York as a child. Lewis left an estate valued at over $25,000 upon his death at the turn of the 20th century. 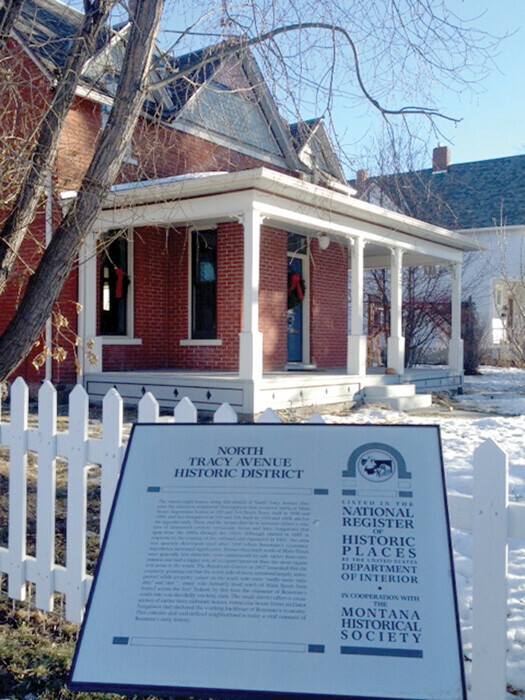 His home, at 308 South Bozeman Avenue, is individually listed on the National Register of Historic Places. Richard and Mary McDonald were also part of Bozeman’s post-Civil War black population. The McDonalds owned a freighting business and lived two blocks west of Lewis, at 308 South Tracy Avenue. Their home is part of the South Tracy/ South Black Historic District. Harrison achieved a modicum of financial success. Deed records indicate that in November 1879 he purchased two 25-foot wide lots in the middle of the 100 block of South Tracy Avenue. Harrison acquired the property from W. W. Alderson, owner of the Avant Courier newspaper, and sold the property for a $90 profit eight months later. The deeds for these transactions make no mention of structures on the property. A one story residence, with a centered front porch, existed on the site by 1889. Thirteen days after selling the South Tracy property, Harrison paid $135 for two 25-foot wide lots on the north side of the 100 block of West Mendenhall Street. Harrison used this parcel as collateral for a number of mortgages before selling the parcel in 1889. The 1889 Sanborn Fire Insurance Maps show a footprint of a one-and-one half story building arranged in a T, with the top of the T running parallel to the street. A single story porch is centered on the building and a one story porch squares the eastern side of the T, to the right of the entrance. The residence’s construction material is unknown. Now addressed as 117-121 West Mendenhall, the property is a parking lot. In February of 1883 Harrison purchased two lots in the center of the 400 block of North Black Avenue from William Beall. The deed describes the transaction as “in consideration of $300 and with the agreement that Harrison…build a neat frame house” on the site. The modest single story residence, located at 409 North Black Avenue, was demolished in 2010. In February 1887, William Beall sold Harrison lots 15 and 16 in block D of Beall’s 2nd addition. Now the location of the residence at 322 North Tracy, the deed identified a sale price of $300, and that “As part of the consideration for the above lots [Harrison] agrees to erect on said lots a neat cottage residence.” Harrison expanded this property in March 1888, when he purchased lot 14 from Beall for $150. The footprint of the frame house remaining at this intersection bears a striking resemblance to that of the West Mendenhall property. The South Black residence is one-and-one half stories, has a T-plan footprint with the top of the T parallel to South Black Avenue and an entry vestibule centered on the street façade. As with the West Mendenhall property, a porch squared the right side of the T. Though Harrison did not own the South Black property, perhaps he constructed the residence and others? Harrison again expanded the North Tracy parcel on April 7, 1890 when he purchased lots 12 and 13 in block D for $275 from W. Beall. This transaction made him the owner of half of a block face between Villard and the alley, on the east side of North Tracy Avenue. Harrison mortgaged lots 12-16 of Block D the next day to the Pioneer Building and Loan. In July of 1890, Harrison sold the North Black property to J.V. Bogert for $600. Perhaps the cash from this sale funded construction of the North Tracy house, as tax records indicate 1890 as the date of construction for 322 North Tracy. The North Tracy residence first appeared on the November 1891 Sanborn Map. As with previous residences affiliated with Harrison, the North Tracy residence is a T-plan, with the top of the T running parallel to the street. The same one-story entry vestibule is centered on the building’s street façade. Two details are worthy of note. First, the residence may not have been entirely finished. A porch which squared right side of the T was added sometime before 1904. Second, the lines on Sanborn Maps indicate ownership boundaries, not lot lines. By November 1891 Harrison no longer owned all the property from Villard to the alley. The 1892-93 Polk Directories, nonetheless, identified Harrison as ““Mason. Col’d. Arrived 1876 from Utah,” and listed his place of residence as 322 North Tracy. Tracing Harrison’s life becomes murky after 1893. It’s difficult to ascertain when he left Bozeman, and under what circumstances he discharged the remainder of the North Tracy mortgage. A December 1898 marriage certificate indicates a black George Harrison, born in New York to Joseph Harrison and Sarah Crump Harrison in 1866, married a divorcee named Hannah Robinson. The 1900 census recorded a single, black day laborer, born in New York in 1868, named George Harrison living as a boarder in the Nevitt Block on Main Street in Bozeman. In Helena in 1906, Anna Walker married George Harrison, a black man from Utica, New York born in 1864 to Joseph and Sarah Crump Harrison. To add a final layer of mystery, a 1918 draft registration card for Walter George Harrison, a black barber in Great Falls, named his father George W. Harrison as his heir. Walter Harrison was born April 4, 1885, a time period during which the George Harrison was active in Bozeman. The draft card does not request Walter’s place of birth. The end of George Harrison’s life is unknown. He is not buried in Sunset Hills Cemetery.